In case you’ve been too busy playing Final Fantasy XV for most of this week, you should know that the Organization of Petroleum Exporting Countries (OPEC) just came up with a historic deal in their meeting this week. Just last Wednesday, all 14 (but now 13) OPEC members have decided to reduce their oil production for a spell. This is a pretty big deal considering that the members have not played nice since an output cut deal in 2008. Heck, it didn’t even look like there was going to be a deal up until the 11th hour when Saudi Arabia finally yielded to Iran’s requests for exemptions! But economics won in the end, it seems. With Black Crack losing more than half of its value since 2014, the world’s major oil producers are forced to address the global oil oversupply issue in an effort to pull prices back up. Saudi Arabia, OPEC’s largest producer and de facto leader, will reduce its output by 486,000 to 10.058 mb/d. The United Arab Emirates (UAE) will cut its production by 139,000 barrels a day to 2.874 mb/d while Kuwait will reduce 131,000 a day to 2.707 mb/d. Rounding up the top four with the biggest cuts is Iraq, which is OPEC’s second largest producer and has previously pushed for exemptions due to its battle with Islamic State. It eventually agreed to cut 210,000 to 4.351 mb/d. Iran, which is OPEC’s third largest producer, initially wanted to reach its pre-sanction levels of 4 mb/d. Saudi said “uh-uh” and pushed for a freeze at 3.7 mb/d. They eventually reached a compromise where Iran is allowed to INCREASE its oil production by 90,000 to 3.8 mb/d. 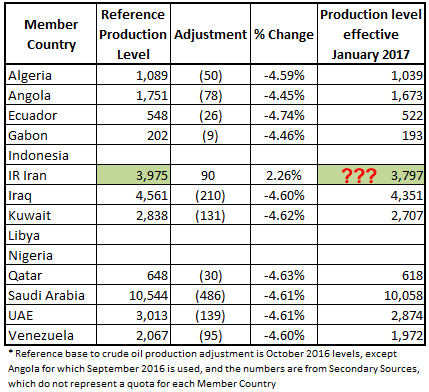 Interestingly, Iran’s new production levels is actually LOWER in 2017 if the chart above is any indication. Think it’s a typo? Or a way for Iran to declare victory today and still reduce output next year? Meanwhile Libya and Nigeria, which both dealt with production disruptions due to militant attacks, are exempted from making any cuts during the six-month period. Russia may not be with the OPEC gang, but it has also pledged to cut by as much as 300,000 barrels a day “conditional on its technical abilities.” This may not be worth much since they’ve been pumping at record high levels, but it’s still a good gesture coming from the largest oil producer outside the OPEC. One country that’s NOT sitting with the OPEC gang anytime soon is Indonesia. It’s not clear whether it was kicked out or it was voluntary, but the Asian country now has its membership suspended. Recall that Indonesia already bailed in 2009 as dwindling production meant it had become a net importer of crude oil, which is against OPEC’s statute for full membership. According to Nigeria’s Oil Minister, Indonesia was “unable to contribute a large enough cut.” However, analysts are quick to point out that the suspension effectively gives Indonesia the green light to pump as much as it wants. Coincidence? We think not! There will be a production police! And no, it won’t be called the “Police of OPEC Production” or “PoOP.” The goal of the Ministerial Monitoring Committee (MMC) is to “closely monitor the implementation of and compliance with this Agreement and report to the Conference.” It will be composed of Algeria, Kuwait, Venezuela, and two participating non-OPEC countries, chaired by Kuwait and assisted by the OPEC Secretariat. At least according to the Conference minutes. See, the group has crunched the numbers since its meeting in Algeria and now they’re expecting non-OPEC supply to contract by 800,000 mb/d for the rest of 2016 before eventually growing by 300,000 mb/d in 2017. World oil demand is also set grow at “healthy” levels of around 1.2 mb/d in both 2016 and 2017. Meanwhile, global growth is expected to expand by 2.9% in 2016 and 3.1% in 2017. The numbers support that a “market rebalancing” is underway, although OPEC members also stressed that Organization for Economic Cooperation and Development (OECD) and non-OECD inventories still stand well above the five-year average. 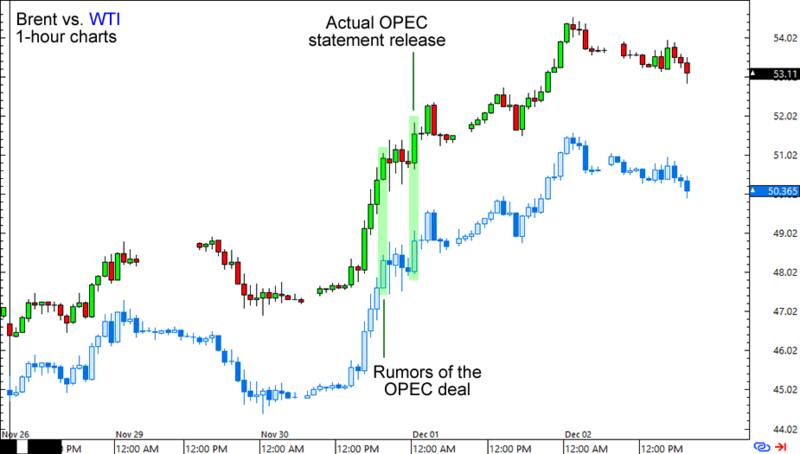 The deal came as a surprise for many market players who have lost confidence in OPEC’s ability to rally its troops and influence the oil markets. Well, the OPEC sure showed them! Brent crude shot up to a high of $52.36 before ending the day 8.6% higher at $51.52, while the U.S. crude oil prices also popped up to $49.90 before calling it a day at $49.13. Not everyone is convinced, however. First, these OPEC members were more or less pumping at RECORD HIGH levels before the deal took place. Saudi Arabia, for example, peaked at 10.673 mb/d in July while Russia just set a post-Soviet record high production in September. And then there’s the quota reinforcement issue, something that OPEC doesn’t have a good track record on. Based on how oil prices have sustained their gains though (Brent oil is currently above $53), it seems like market players are willing to give the latest OPEC deal the benefit of the doubt.